1. You can use use VLOOKUP to perform a lookup with multiple criteria by adding a helper column to the data. 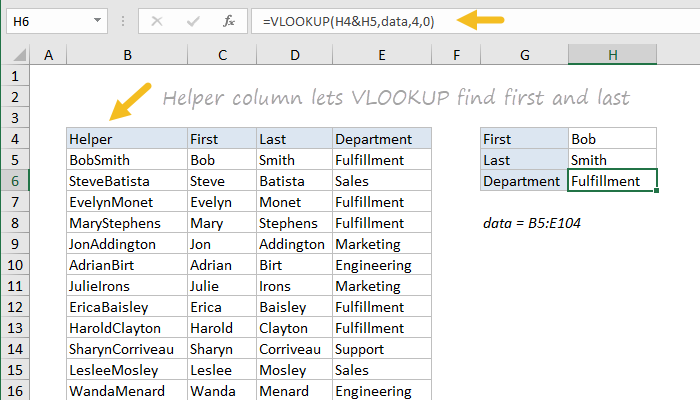 In the example above, a helper column is used to concatenate first and last names, so that VLOOKUP can be used to find department using both names. Click for details on this formula. 2. You can use a helper column with a formula that returns a value like TRUE for rows that meet specific conditions, then use go to special and delete only those rows. Watch this video to see a "shortcut recipe" to remove specific rows using this technique. The recipe using formulas starts at about 6:00 in the video. 3. You can use a helper column for sorting. For example, you could add values to a helper column to sort a table in ways not easy or possible with the original set of data. You can also use a helper column to preserve and restore original sort order.